Multiple-word search terms return results that contain all of the terms. When results appear, click Jump to view that post in the channel archive. File attachments and their filenames are not searched. If file attachments show up in the search results, it’s because they are attached to messages that match the search query. Archived channels can be searched as long as you are a member of that channel. To remove archived channels from your search results, you can leave those channels. If you are unable to see messages in archived channels in your search results, ask your System Administrator if Allow users to view archived channels has been disabled under System Console > Users and Teams. You can use search modifiers such as from:dave to return results only from certain people or in certain channels. For more information about this, see the Search Modifiers section. Like many search engines, common words such as the, which, and are (known as “stop words”), as well as two-letter and one-letter search terms, are not shown in search because they typically return too many results. See database documentation on MySQL and Postgres for a full list. Use from: to find posts from specific users and in: to find posts in specific public or private channels, as well as direct and group messages. For example: Searching Mattermost in:town-square only returns messages in Town Square that contain Mattermost. Searching Mattermost in: @john.doe returns messages that contain Mattermost in your direct message history with John Doe. Use before: to find posts before a specified date and after: to find posts after a specified date. Use both before: and after: together to search in a specified date range. Use on: to find posts from a specific date. 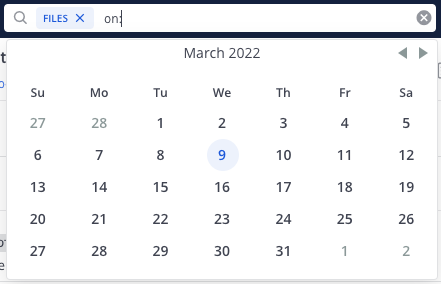 You can use the date picker to select a date or you can type it in YYYY-MM-DD format. For example: Searching website before: 2018-09-01 will return messages containing the keyword website posted prior to September 1, 2018. Searching website after: 2018-08-01 will return messages containing the keyword website posted after August 1, 2018. Searching website before: 2018-09-01 after: 2018-08-01 will return all messages that contain the keyword website that were posted between August 1, 2018 and September 1, 2018. Searching website on: 2018-09-01 will return messages that contain the keyword website that were posted on September 1, 2018. Use quotation marks to return search results for exact terms. For example: Searching "Mattermost website" returns messages containing the exact phrase Mattermost website, but not messages containing Mattermost and website separately. Use the * character for wildcard searches that match within words. For example: Searching for rea* brings back messages containing reach, reason and other words starting with rea. Hashtags are searchable labels for posts. Search for any posts containing a hashtag by clicking the hashtag in an existing post or typing the hashtag with the pound symbol into the search bar. Create hashtags in any post by using the pound sign # followed by alphanumeric or other unicode characters. Do not start with a number. Are at least 3 characters long, not including the #. Are made up of alphanumeric or other unicode characters. May contain dots, dashes or underscores. Hashtags do not link to channels. For example, if you have a channel named “Marketing”, clicking a #marketing hashtag does not redirect you to that channel. You can link to public channels using ~ followed by the channel name, for example ~marketing. IP addresses, for example 10.100.200.101, do not return results. The best experience for searching in Chinese, Korean and Japanese is to use MySQL 5.7.6 or later with special configuration. Please see documentation. You can search to some degree without this configuration by adding * to the end of search terms. By default, Mattermost uses full text search support included in MySQL and PostgreSQL. These databases have slightly different search behavior. Check Main Menu > About Mattermost to see which database you’re using. Email addresses do not return results. Hashtags or recent mentions of usernames containing a dash do not return search results. Terms containing a dash return incorrect results as dashes are ignored in the search engine. Hashtags or recent mentions of usernames containing a dot do not return search results.